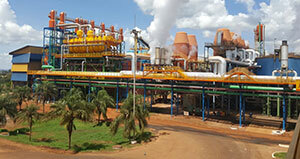 Coruripe is a Brazilian sugar group, renowned for its operational excellence, which owns 5 factories. After the delivery of a Fletcher continuous vacuum pan for massecuite C in 2007 for its factory located in the Alagoas state, the client decided to renew its thrust in Fives for its factory in Carneirinho, this time with the Cail & Fletcher SMART Control™ associated to the equipment. The Cail & Fletcher SMART Control™ is a web application with dedicated services developed by Fives. These services enable the monitoring and the analysis of the equipment's operation at a distance, from any computer or mobile device connected to the internet. The connected equipment offers an optimized operation during the entire campaign. The project also includes the supply of 6 Cail & Fletcher SUMO Pumps and 6 Cail & Fletcher Hydrotrac probes to measure the Brix of the massecuite at several places during the process and allow an automatic operation thanks to a self-regulation. As a result of this successful commissioning, the customer expects to produce14.35 million tons of cane during the growing season in the Minas Gerais plants and to increase sugar production by 5.6%.